Children where used as cheap labor in bad conditions. They where paid much less than an adult male. 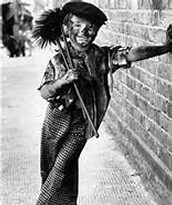 Children would be paid around 2 pennies a day for around 12 hours of work. 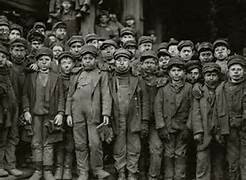 The working children faced dangerous jobs such as the coal mines, and factories. 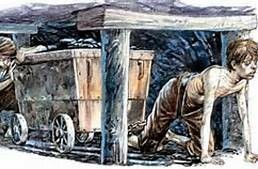 The coal mines claimed the death of many children from caves collapsing and from Poisons in the air. The mills would have the children fix the machines in the dark and make cloth. The machines had no safety guards, and rails so kids lost fingers. Families were okay with the idea of child labor because farmers had there children work on the farm. The government steeped in and made laws that prevented cotton mill owners to not hire Children under 8-9 years old. 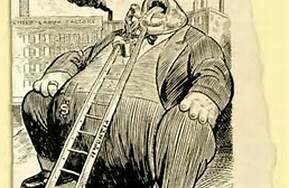 in 1840 investigators where hired to check the factories and make sure the owners where following the law.